Join in on the underwater excitement in this puzzle adventure that has plenty of cash to offer. Click here to play! In a unique slots experience, you will have to change the way you think about combinations in order to take home some massive cash jackpots. Cubis is an incredible slot machine played across 15 lines. Similar to Bejeweled, there are no obvious reels, but the game has a definite 3 x 5 reel feel. Every time you earn a winning combination, you will automatically be paid out according to the pay table, with those cubes disappearing and allowing new cubes to be dropped in. 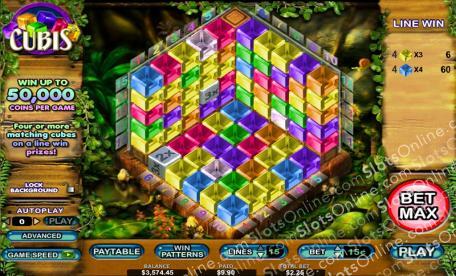 The Blue, Green, and Diamond cubes are all lucrative items, and can pay out up to 2500, 3000, and 4000 times your initial wager on winning combos. The Dice is Wild and can substitute for any other cube on the slots, multiplying the total winnings depending on the number rolled. Also, if you manage to earn all 10 Wilds in one turn you will be paid out 10,000 times your initial stake. So join in on the Cubis adventure today! The Dice is Wild and offers up to 10,000 times your original bet on winning combos. Additionally, the Dice can be substituted for any other cube on the reels.